Repair lob marks on the green. Do not walk up the face of bunkers. Always leave a bunker by the way you entered it and smooth out your footmarks. 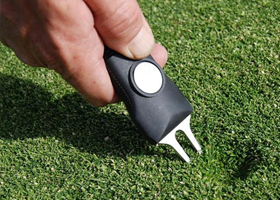 Rakes must be left in the side of bunkers within reach and pointing in the direction of play. Do not place your bag of clubs on the putting green. Practice on fairways, in bunkers, or to a green is not permitted. Use practice areas provided, exercising care at all times. 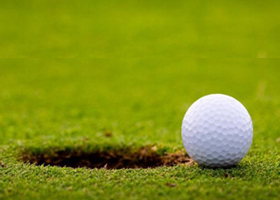 Practice balls are not to be hit onto adjoining fairways during competition play. 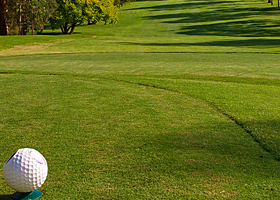 Members playing a practice round on the course are permitted to play two balls only. Practice prior to match play events must be restricted to two balls per player. All Members should be on the lookout for vandals and trespassers. Vigilance in this way may help reduce the extent of vandalism and damage on the course. Please advise trespassers e.g. : joggers, people walking dogs, etc. that the Golf Course is private property. Whilst every effort is made to minimise work on the course during competition play, sometimes it is unavoidable. Wide wheel buggies are mandatory and may be wheeled across greens to reduce wear on green surrounds. Use good judgement in times of bad weather. There must not be more than two persons to each motorised cart. Drivers of motorised carts must hold a current motor vehicle licence. Motorised carts must not be driven over tees and must not be driven within ten metres of any green or inside lines marked on fairways indicating no carts. When parking the motorised carts or approaching the green, drivers must keep the motorised carts away from the front of the green and use designated parking areas. Motorised carts must not be parked in front of greens. 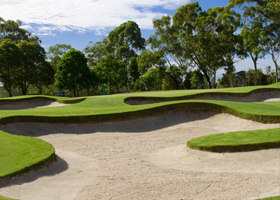 Motorised carts must not be driven between bunkers and greens or on shoulders of greens. When paths are provided, motorised carts must use them. Players using motorised carts must maintain their normal place in the field and have no special priority. All signs on the course relating to motorised cart use must be observed at all times. Children must not be left unattended in a motorised cart. Only two sets of clubs are permitted for each motorised cart. Motorised carts are to be parked away from greens. Please obey parking notices. Players failing to comply with these rules designed to preserve the course, could lose their privilege to drive motorised carts. Visitors are prohibited from bringing motorised ride on transportation to use on the course.